On August 1st, a sign outside the Palisade High School read "Summer's Almost Over." Boy, did that make me sad. Technically, summer was only HALF over, and the thought that someone would proclaim otherwise was freaking me out - - especially coming from a school. Unfortunately, here on the Western Slope, school starts in mid-August, not the first of September (after Labor Day) as it did when I was growing up. For the kids in this community, summer WAS almost over, and it got me to thinking about the days of yore. While my grand kids spent a lot of time playing video games this summer, when I was a kid, I found a spot to hide a pile of books and read. I had a particular spot under a shady tree in an orchard in our back yard, where a kid could lie on her back and alternate a story with watching fluffy cloud-characters puffing across the sky. I read all the Nancy Drews and Robert Louis Stevenson, and started into Ayn Rand when I was 11. As long as I was out of the way, I could lie there all day without much of a care. But that was long ago. Right after dinosaurs. Eventually summer ends, and we all grow up, and finding a day to lie in the grass and read a book becomes a relic of by-gone days. Even when I do manage to find that shady tree, and pull out my Kindle, the evil Taskmaster-in-my-Brain rears her ugly head over and over with things I should be doing. Sometimes I'm forced to lock the doors and turn off the computer and stab her with my steely knife to keep her at bay. I did that yesterday. I locked myself in the sewing room - - the one room in my house devoid of electronics, and sat in the daybed by the window where I could see the clouds over Mt. Garfield. I found a true story about a young British kid who decides to volunteer for a year at an animal rescue camp in Ecuador ("A Bear Ate My Pants"). Funny, witty, insightful. I felt like I was transported for the day on an adventure to a foreign land. As should be, I was sorry when the story ended and the sun was setting on another summer day. Today there were lots of posts on Facebook about getting ready for fall - - people who are tired of the heat and looking forward to the changing leaves, the harvest and Halloween. I want to stomp my foot and say "hold on there Bobalooey, it ain't even September yet!" It's curious how we humans have a hard time appreciating what is at our feet today in glorious splendor. 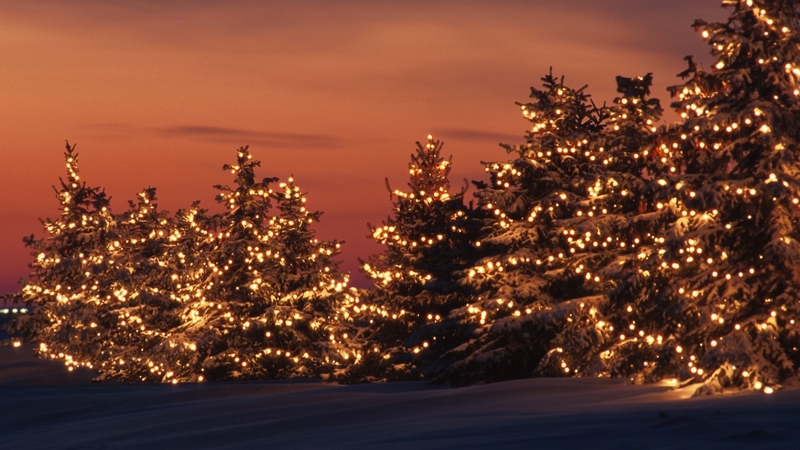 If it is summer, we want the harvest moon, amongst the red and gold leaves, we dream of twinkling Christmas lights. In the darkness we plan for fresh spring flowers, and then again for summer's sunny tune. It is 124 days until Christmas 2013 - - but that is one hundred and twenty four days away. Be sure to stop and feel the sun on your face, smell the roses, read a book under the clouds, and enjoy a summer day. No waiting. It's here now. P.S. I know my son-in-law likes to play video games on his days off from being a super nurse, daddy and husband. I'm not sure that he has to fight the "taskmaster in his brain" as much as he does my daughter, though. SANTA NANA'S TIP. If you have a Kindle or other reading device you can get FREE books (and sale books) every single day on BookBub.com. Sign up for their daily e-mail. Also, you can download/borrow books from your library for free. Libraries vary on how long you can keep your books, but it is pretty much like borrowing a hard copy, with options to renew. Also, there's never an overdue charge. Next entry What's the matter with kids today? I really enjoy your thoughts and comments. You are a great Mrs. Claus.